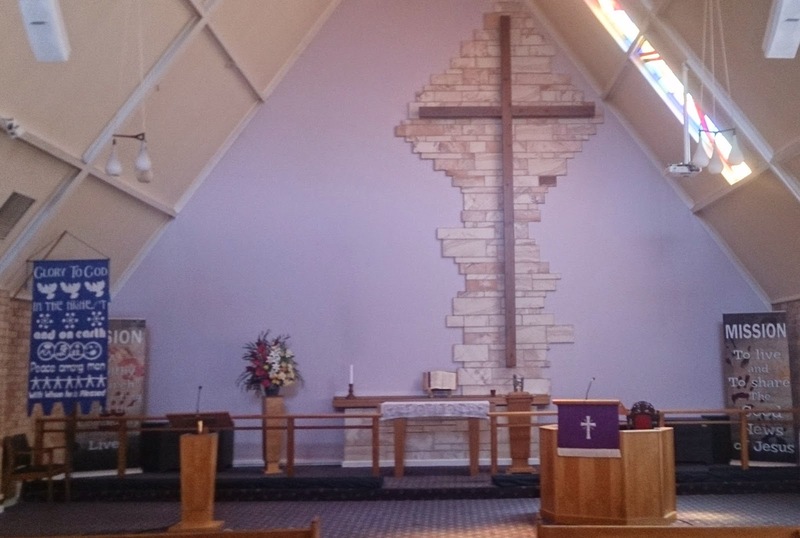 My dad colloquially refers to this church as 'the A-frame church' because, well, if you look at the photo of the front of the church you can see why. Anyway, this was the old Methodist Church (before the Methodist, Presbyterian, and Congregationalist churches merged to become the Uniting Church in 1977), and a plaque next to the old Methodist Cemetery near the council buildings indicates that the current building was opened in 1961. Previously the church was located at the corner of John and Church Streets, though the former building is no longer there, having since been replaced by a Coles Supermarket, which was later knocked down to make way for a park (or more precisely, a Town Square). However, you can still find the original cemetery, which I remember being hidden from view by a tall corrugated iron fence (which as a child I could never see over so I was always left with wonder as to what was behind it) but has since been replaced so you can now see the original cemetery. 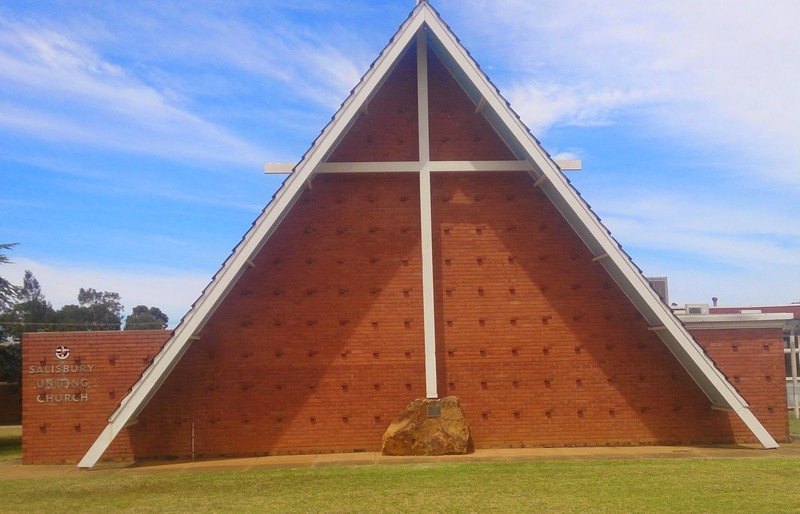 The reason this particular church stands out in my mind is because as a child I used to attend the primary school (Salisbury Primary School) across the road, and one day one of my class mates invited the entire class to come to a Kid's Club that the church held every Monday. So I asked my parents if I could go, and they were agreeable, so me, my friend, and a bunch of our other class mates all went across the road to the church every Monday afternoon where we would spend the next hour or so having a lot of fun. Personally, I can't remember all that much beyond that except maybe running around the church having fun, though I believe that they did teach us stories and had games prepared for us. Unfortunately these days the Kid's Club is gone, though they do have a couple of events, including a pancake day, involving the students. However the days of some child inviting all his friends at school over for some fun at the church seem to be long gone (which is a shame because I believe children should be given the option to learn about, and even participate in, religion if that is what they choose). The church itself has two services, a 9:00 am contemporary service, and a 11:00 am more traditional service with a choir. When I was in Adelaide recently my brother and I were planning on going to the 11:00 am service, but it turned out that I had read the wrong sign because over the Christmas/New Year period they had combined the services into one 10:00 am service. As such my brother and I wandered into the church just to catch the last two hymns. It wasn't all that bad though because we were immediately welcomed by the entire congregation, and my brother was able to find somebody to talk to, or more precisely, stand next to and keep him company (as he is prone to do, but unfortunately not everybody really understands him). They also gave us a calendar to take home (though, unfortunately, there were no impressionist paintings, however there was a cool photo of the interior of the Moonta Mines Uniting Church - however all of the photos of it that I could find on the internet are copyright, so I will instead post a photo of the Christmas Tree out the front of this church). You can view a picture of the Moonta Mines Uniting Church here. Since I had identified myself as a visitor to Adelaide, having returned for the Christmas break, they also kindly told me of all the services they were holding over the Christmas, which included a carol service that night. I asked my brother if he would be interested in going and I received a very eager 'yes please'. So, later that night, we make the trek from my parent's house down to the church for a sausage sizzle and some carols. It was a little different to the other carol service I went to at my local church, but then that was to be expected. What was cool was that they had a lucky dip for the children, and also some soft drinks along with the sausages (but no onion, to my disappointment). They sang all of the traditional carols, and in between members of the congregation would read out the Christmas story as it appears in the gospel of Matthew. One of the ladies that was running the service even performed a couple of solo songs, which I must admit were very impressive. Granted, much has changed since the days that I was running around the halls as a kid, but from what I could see the children were still present along with their parents, and the cultural mix had begun to develop. However, a quick glance over their website indicated that the church building is shared by a number of other congregations, such as a Burmese, Phillipino, Rumanian, Spanish, and a Chin congregation. As we were walking down Brown Terrace before the church, there was even what sounded like a full gospel, African American congregation blaring out of the nearby recreation hall (though I do not believe that it has any connection with this church). Along with all that, Pastor Ken also told me that they were in the process of setting up an evening service in a room called 'the Gathering Place' to run a church service that was not really a formal service, but a more relaxed gathering. I've been to a couple before and I must admit that I quite enjoyed them. I can't quite say how this will be run, but the other ones that I have been to generally included a meal, a short talk, and a discussion with the small group around a table. So, while I now live seven hundred kilometres away (and when I did live in Adelaide I generally went to my parent's church) it is still good to revisit places from years gone by, if not to see how things have changed, but to definitely bring back some old memories. This post also appears on my travel blog.